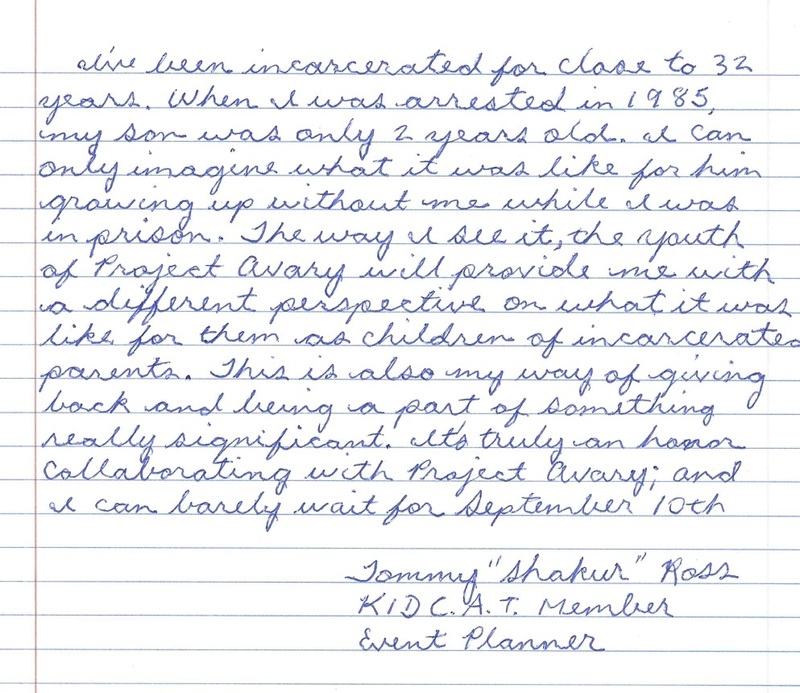 Project Avary builds brighter futures for children with parents in prison. KidCAT is a group of juvenile lifers inside San Quentin who are committed to helping one another heal from past trauma and reconcile past mistakes. These two organizations are coming together on June 22nd, 2019 for the 3rd Annual March for the Next Generation. This groundbreaking event is held at the lower yard of San Quentin State Prison. Members from the community, the men of San Quentin, and Project Avary staff & alumni will join together to walk around the prison yard. The first round will be walked in silence as a token of respect and honor for children who have been impacted by parental incarceration. In between rounds, the Project Avary youth, KidCAT members, and incarcerated parents will share poems, songs, dances, and art connected to the impact incarceration has on families. This event will help raise awareness about cycles of generational incarceration and is a fundraiser for Project Avary. "We can't leave right now, but our desire to contribute to the world outside the walls is real. If I can have any part in helping the next generation not fall onto the same path I did, I'm going to take it. This is our gift to them." Yes! I would like to support the San Quentin walk! Did you know that 2.7 million children have a parent in prison and that children of incarcerated parents are exponentially more at risk to go to prison themselves? Children face formidable challenges when they lose a parent to incarceration, and, despite children of incarcerated parents being one of the most at-risk youth populations, they are often overlooked. “We want to be treated with support, not neglect,” Joseph, one of Project Avary's alumni said. “Even if we have a relationship with our parent, they can’t physically be here to help us. We need the support of our community: Hug me. Motivate me. Tell me I’m going to be OK, and just maybe I will be." The men of San Quentin understand this need, as they've seen generation after generation--grandfathers, sons, then grandsons--go through the system. Many of them had a parent that was incarcerated and many have children they're praying don't get caught up in the cycle. Let's help the men of San Quentin Prison give the gift of hope to the next generation.